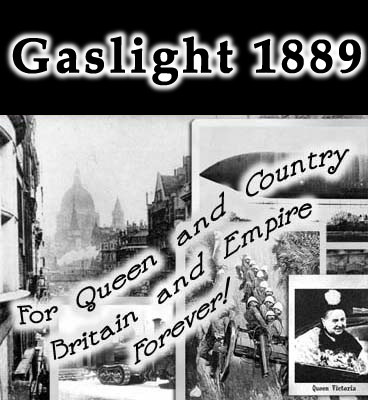 This is the main index page for the ASMRB's "Gaslight 1889" campaign -- set in the Space: 1889 universe, but using the Call of Cthulhu rules system. Clubs and Clubland -- for men and women of sufficient social standing. The Little Wonder -- a miniature juggernaut. The Mercury -- an aerial yacht. The British Calendar -- events throughout the year. Various Currencies -- money of many lands. Awards, Orders and Decorations -- tinsel and fluff. Last update April 5, 2005. Original contents copyright ©2003-2005 by Michael Blum; contact me at michaelb "at" skotos dee oh tee net.